Old enough to be reading fairy tales again, and reading lots more for good measure. I might have read this book much sooner if I hadn't been unfairly prejudiced against it since Mrs. Hodges' tenth grade English class. Most people have a story where the teaching of literature ended up running counter to their enjoyment of it; luckily, mine is confined to one year of high school. For some reason, rather than read whole works, our class was assigned to read several single chapters excerpted from Great Books, including Lord of the Flies, Les Miserables, and The Heart is a Lonely Hunter. This is a terrible teaching method, leaving out all the context, development, and nuance; in the case of this book, my impression was that it consisted of terse, cold writing, flat characters, and dull themes. Ironically perhaps, these are all opposite impressions gathered from reading the book in full as it was meant to be read. This is a remarkable book, perhaps the best I've read this year. While I regret not reading McCullers' masterpiece sooner, I also think I may never have appreciated this book more than I do now. I am only 25 years old, barely outside adolescence, but at the same time teetering over the rim of that era of precociousness. Bruce Springsteen was just 25 when he exploded with Born to Run, but it won't be too long before I can quote whoever it was who pointed out, "At my age, Keats had already been dead for three years!" 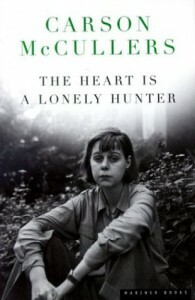 McCullers was a prodigy herself, publishing The Heart is a Lonely Hunter at only 23 years old. It's the kind of fact that makes my old dream of writing stories seem within reach, and at the same time recognize, I could never be this good. This is so good. This is perfect. Readers say this is the story of John Singer, the town's deaf-mute whose pleasant demeanor and fair mind entrance other lonely misfits to confide and idolize the one person who can't talk to them, while he himself has only one true friend in an angry, sickened deaf mute named Antonapoulos. Or they say that it is the story of Mick, the tomboy teenager who can't stop hearing music and resembles McCullers autobiographically. But I was most drawn toward the story of bartender Biff Brannon, who watches and ponders and hopes to understand. He stands in for the writer, since as fellow writing prodigy David Foster Wallace points out in his essay "E Plurabus Unam: Television and U.S. Fiction", writers are born watchers. Biff who keeps the cafe open late despite there being no money in it, who is strangely drawn toward young Mick for reasons he can't put into words. He examined the zinnia he had intended to save. As he held it in the palm of his hand to the light the flower was not such a curious specimen after all. Not worth saving. He plucked the soft, bright petals and the last one came out on love. But who? Who would he be loving now? No one person. Anybody decent who came in out of the street to sit for an hour and have a drink. But no one person. He had known his loves and they were over. Alice, Madeline and Gyp. Finished. Leaving him either better or worse. Which? However you looked at it. Everyone in this book is lonely, from Jake the drunk communist mechanic, trying to change the world one "don't-know" at a time, to Doctor Copeland, a black doctor angry at the injustices against his people and also seeking change and reform, but seeing little hope in the future. If I had read this book much sooner, I wouldn't have understood this so well. I spent much of my life growing up very alone and isolated and numb to much of the world, living through stories and books and scientific facts without feeling much need for people. And then I loved someone and through understanding them, better understood myself, including a deep affection and appreciation for all people that had been buried under cynicism and a facade of misanthropy. This is a book that feels all of that, the love, loss, connection, and isolation. What seemed like emotionless prose to my tenth-grade eyes is actually some of the most sensitive, warmly quiet writing I've ever come across. 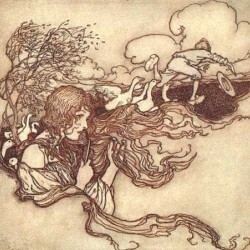 It connects with the darkness and light within most people in plain, unornamental English, carefully astute observation, and a central fascination with that dilemma of dilemmas: each of us stands essentially alone, and yet, as Doctor Copeland says, this is also the most deadly thing a man can do. The twenty-something author provides a possible antidote to this paradox: we must try. Try to love, try to labor, and try not to be alone, though maybe we always will be. We have to keep trying.